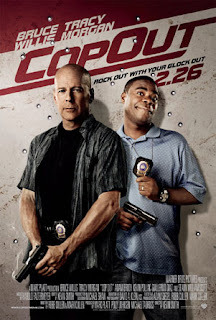 Blu Ray Review - "Cop Out"
"Cop Out" is the most recent work of writer-director-"Star Wars" nerd Kevin Smith. The movie centers around two half-idiot cops with a knack for the outrageous (Bruce Willis and Tracy Morgan) who find themselves in the middle of a case that is way above their heads. As the shenanigans unfold, their personal lives begin to fall apart and the entire situation spins rapidly out of control. All cards on the table, I'm not a fan of Kevin Smith. "Mallrats" is pretty funny and I appreciate a good "Star Wars" reference more than just about anyone who isn't George Lucas himself. But for the most part, Smith is the poster boy for half-conceived ideas. Most of his movies seem to be based on one funny idea or situation that is then painstakingly expounded upon for two hours. Smith is also extremely proud of himself and quick to lash out at anyone who doesn't appreciate his genius. To be fair, Kevin (in case you're reading), I know plenty of people who are big fans of your work. I'm just not one of them. So while I haven't liked a Smith movie in 15 years, I confess that the trailer for "Cop Out" made me giggle every single time. I didn't want to laugh and more than once I crossed my arms, clinched my jaw and refused to do so until I couldn't take it anymore. I knew this movie was bound to be INCREDIBLY stupid and yet it was everything I could do to keep from blowing my money on a theater viewing. No such fighting over an in-home viewing, though. The first half of "Cop Out" is ridiculous, stupid, immature fun. I laughed a lot. My man crush on Bruce Willis has been well stated throughout the course of my writing "career" and here he shows again how versatile he is. The delivery on some of his lines is impeccable. Tracy Morgan was long considered a nemesis of mine but his work here is very similar to the hilarious run he's had on "30 Rock." Seann William Scott also managed to not annoy me despite having made three appearances in my house in the last week ("Planet 51" and "The Rundown"). The movie moves pretty fast, there's a fair amount of wit to the dialogue, and the action sequences are decent enough. At some point, however, "Cop Out" just runs out of gas. There's no defining moment that separates good from bad but somewhere in there I realized I wasn't laughing or having much fun anymore. And it seemed like everyone involved was in the same camp. The last 45 minutes is dry and formulaic, lacking the life that the first half exhibited. It's a decent effort and maybe my second favorite Smith movie; but then again, that's not really saying much is it?